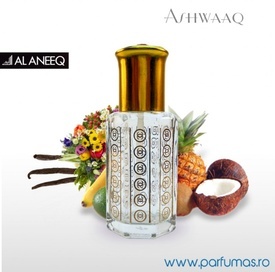 Parfum unisex cu note florale, fructe tropicale si vanilie. "Ashwaaq" in traducere "dragoste, afectiune" este un parfum concentrat pe baza de ulei, de inalta calitate, nu contine alcool si confera persistenta indelungata.Sticla este prevazuta cu sistem roll-on sau cu betisor de plastic in interior pentru aplicarea cat mai usoara a parfumului. 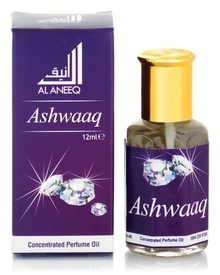 The Arabic meaning of Ashwaaq is love or affection. 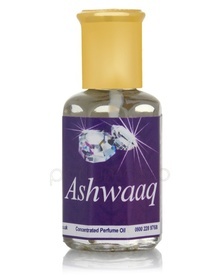 A fragrance that will entice your other half and make you more beloved in their eyes. This creation starts off with a fresh, green, tropical, fruity note whilst the middle is composed of exotic woody, flowery and fruity notes. The exhilirating base of musk and balsamic notes are present throughout.